It's absolutely astounding to me how much good science fiction came out of the year 1997. We have the enduring classics Men in Black and Starship Troopers, the lesser known but still amazing cult films The Fifth Element, Face/Off, and Gattaca*, the small but memorable sci-fi horror films Cube, Mimic, and Event Horizon*, and even the unnecessary sequels The Lost World: Jurassic Park and Alien: Resurrection. So when I learned that year also included the sci-fi drama Contact from Robert Zemeckis (of Back to the Future* fame) I decided it was worth a look. While I think this is slightly overshadowed by the rest of the year's magnificent films, I certainly wasn't disappointed. The story centers on Eleanor Arroway (Jena Malone, Jodie Foster), an ambitious young scientist determined to discover extraterrestrial life. She meets Palmer Joss (Matthew McConaughey) a charismatic, religious journalist, and while the two initially hit it off, Ellie wants to focus on her work. That is, until her financier David Drumlin (Tom Skerritt) pulls her funding and forces her to find her own support to continue her work. With the financial support of the mysterious S.R. Hadden (John Hurt) and the help of her friend and colleague Kent (William Fichtner), Ellie succeeds in uncovering a message apparently coming from the star Vega. What the message means, and whether the discovery will be hers to investigate, are another matter. As you might expect from Robert Zemeckis, and as you might be able to tell from the rather long list of talented actors working on the film, Contact is a very well made movie. On top of excellent performances from Jodie Foster, William Fichtner, Tom Skerritt, Matthew McConaughey, John Hurt, and a 12-year-old Jena Malone there are also solid supporting performances from David Morse as Ellie's father, James Woods as the president's National Security Advisor, and Rob Lowe as Richard Rank, the leader of the conservative coalition and a parody of the real life Ralph Reed. There are also fun cameos from Larry King, Jay Leno, and the almighty Bill Clinton himself (okay, it's all reappropriated archive footage, but it's still awesome). 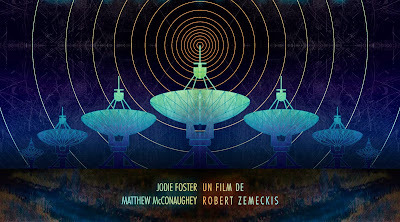 The camerawork is also fabulous: there's one particularly enjoyable long take which follows Jodie Foster from the satellites where she monitors space noise all the way into the comm station where the data is collected. The whole movie is very well put together, and the only thing lacking is occasionally the special effects department. The CGI is fine, but it's not as good as I was expecting with a big budget production like this. Contact's structure is slightly more dubious but in the end works out well enough. The movie runs slightly long at almost two and a half hours and may feel slow from time to time if you don't find yourself lost in the characters. The movie also features one of the banes of my existence, the Hollywood Unnecessary Love Story. The science vs. faith debate functions perfectly well without the leading proponents of each side sleeping together. That said, these two quibbles of mine do work in the end. The long length and slow pace successfully build tension and excitement for the real sci-fi goodness at the end of the movie, and despite my frustration with the ubiquity of unnecessary romances, Jodie Foster and Matthew McConaughey do have some on-screen chemistry. So what is this movie really about? Contact's central themes can be broken apart into two categories: the microscopic which follow the character Eleanor Arroway, and the macroscopic which deal with the questions of science and religion in relation to truth, knowledge, meaning, and happiness. Ellie lost both of her parents when she was a child and was forced to deal with the trauma of growing up alone. She internalized this struggle for the love of the other as a search for truth, and this search for truth takes the shape of the fundamental search for objet a, the lost object or object-cause of desire. At its most basic, she unconsciously believes that her search for extraterrestrial life will lead her back to her parents. Of course in reality the search for the lost object is always an impossible one as the object only ever comes into existence as already lost. There is never a point in which one truly has objet a. In this way, the film functions as an impossible fantasy of finally filling out the primordial lack (Ellie does effectively reunite with her parents). On a larger scale, Contact attempts to pit science against religion. As a scientist in a predominantly Christian country, Ellie is constantly fighting for both autonomy over her project and for her right to not believe in God. The atheist subject is oppressed by the fundamentalist other. But then Ellie returns from her voyage into outer space without any proof and there's a touching moment where the hardline scientist relies on faith to prove her point. The problem is that there is evidence of her trip, her camera recorded 18 hours of static which, like the aliens' original message, must presumably be decoded. The movie literally throws this in at the last minute hoping for the audience to make sense of it. Maybe it makes more sense in the book, but as much as I love the idea that science and religion are simply different methods working towards the same goal of knowledge and truth, Contact ultimately drops the ball on its examination. *Further Reading: check out my reviews of other science fiction from 1997 Gattaca and Event Horizon, and stay tuned for more from that amazing year later this week. For more Robert Zemeckis, check out my review of Back to the Future. I enjoyed this movie at the time it was released - it was right up my alley in terms of themes concerning science vs religion. I watched it again over the years and thought it was still well put together, though not as deep as I'd like. I liked the twist (the 18 minutes of static). I thought the romance probably benefited the movie, gave Jodie Foster's character some irony and depth and personality. I have listened to the audiobook when I was interested in audiobooks (not anymore), but I didn't enjoy it. The book, if I remember correctly, is not the least bit engaging. Can't remember the prime numbers plot (it's simply a weird signal from another star) or the 18 minute static or the science-religion debates. There's obviously no romance. I think Carl Sagan's book was incredibly improved upon with this movie, and if you tackle the book, you'll probably grow disappointed quickly. Just a prediction. Hated the book. Lacked personality and good secondary characters. Yeah I almost feel like I was a little harsh on the movie because it's clearly so well made that I was just looking for flaws, but I guess that's part of what I'm doing here. I did like the movie and would recommend it to other people depending on their taste. As for the book, I agree with you that I don't think I would like it. I've never really liked Carl Sagan. Hello I am the artist who created the artwork you use for this post. It would be nice if you mention my name followed by copyright please.